Brian's post has me very down -- many things we've posted about have me very down at the moment, actually. So, I thought I'd put up a nice picture to brighten my mood, and maybe yours. I started scanning some of my photos from a trip I took to Spain in 1999. 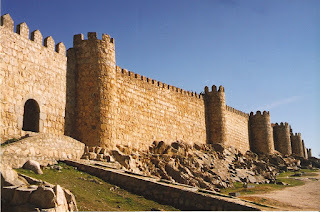 This is the city wall of Avila. I like the picture because the sky is just so blue. It doesn't quite come through in the scanned photo, but trust me, it's alarmingly blue.